CLEARANCE- This brake kit was recently mounted onto a car but returned because the wheels did not properly fit over the brakes. This kit has been inspected and is complete and in "like new" condition. We cannot sell this as new so we have deeply discounted these units to clear it from our inventory. 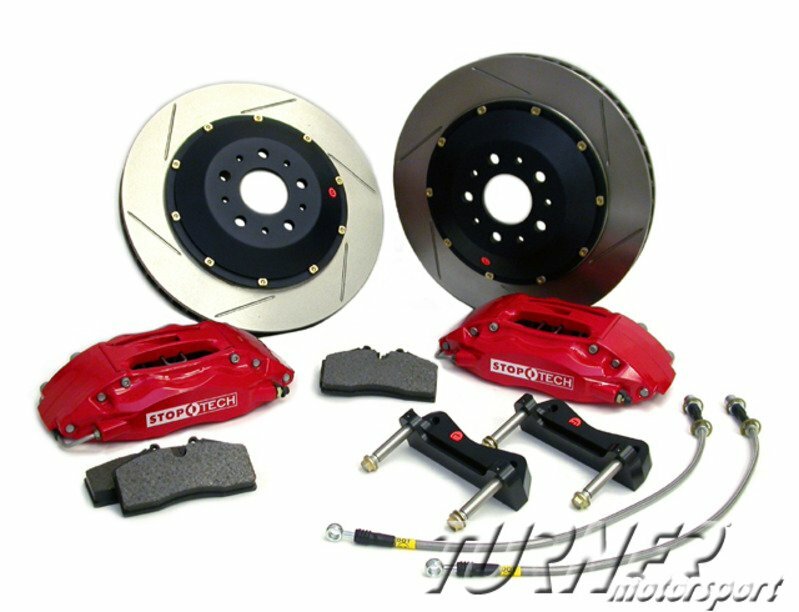 This kit has the red calipers with slotted rotors. StopTech Brakes puts championship-winning race technology and state-of-the-art engineering under your feet. StopTech's Front Big Brake Kit for the E46 M3 (non-ZCP) is engineered to work with the stock brake hydraulics and ABS/DSC system. StopTech builds each kit around the specific vehicle, engineering the system to achieve the correct brake balance. This brake upgrade gives better stopping performance in everyday driving, aggressive street driving, or all-out track days. By increasing the rotor size, using a larger pad, and a fixed forged aluminum caliper, you can improve your braking performance substantially for any condition! StopTech Brakes have been used on Turner Motorsport racecars since 2003, winning 5 sports car championships and recording numerous race wins since.